Feel the sensation of an adventure in the river inside a cave using a lifebelt. While going through the dark valley in the cave with stalactite and stalagmite, you will also have a story about the journey of Joko Singlulung looking for his father. Wading across a river using b is something common, but if the river is located inside a cave, of course it will be an enjoyable yet challenging experience. 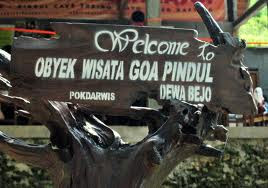 Pindul is a cave that becomes part of the group of seven caves with underground river flowing inside. It is located in a village named Bejiharjo, Karangmojo and it offers the real sensation of adventure. For about 45 to 60 minutes, visitors will be invited to go along the river in the darkness of the bowels of the earth with 300 meters length using lifebelt. This is an activity combining body rafting and caving, and later called cave tubing. No special preparation needed to do cave tubing in Pindul cave. We only need lifebelt, life vest, and headlamp, and those equipments have been provided by the organizer. The still water flow makes it save for everyone, not only adults but also children. The best time to do cave tubing is in the morning at about 9 or 10a.m since the water won’t be too cold. Furthermore, if the weather is clear, at that time we may see the light from heaven which is actually the sunlight from above that goes through the big hole on the top of the cave. While enjoying the smooth wipes on the cold water on our skin in the middle of the cave with less light, the guide told a story of the name Pindul. Based on the legend believed by the indigenous people and passed on orally from generation to the other, the name of Pindul cave and the other caves in Bejiharjo could not be separated from the story of Joko Singlulung’s journey to find his father. After exploring the dense forests, mountains, and rivers, Joko Singlulung got into the caves in Bejiharjo. When he got into one of the cave, he bent the rock, so that the place was named Pindul as the short form of pipi gebendul in Javanese language. Facilities: cave tubing equipments, guide, and snack after the activity.